Pallbearers guide the casket of Chuck Berry out of The Pageant following a viewing and celebration of life event for the rock 'n' roll legend and St. Louis native. Friends and family hug outside The Pageant after the memorial service for rock 'n' roll legend Chuck Berry. Relatives pay respects to Chuck Berry before the start of his celebration of life ceremony. A band plays outside The Pageant at the start of a funeral procession for rock 'n' roll legend Chuck Berry. Musician Billy Peek shows off Chuck Berry's signature duckwalk while playing the legend's hit song "Johnny B. Goode." Gene Simmons pays tribute to Chuck Berry. Charles Berry Jr. receives a hug from his cousin Henry Berry III after speaking about his father, Chuck Berry. Pallbearers guide the casket of Chuck Berry out of The Pageant following a viewing and celebration of life event for the rock-n-roll legend and St. Louis native. Guests take photos of the start of the funeral procession for rock- 'n' roll legend Chuck Berry. A line of fans formed around the block outside the Pageant Theater in the Delmar Loop Sunday to say goodbye to rock 'n'roll legend and St. Louis native Chuck Berry. They joined a capacity crowd of dignitaries, family and friends inside for a funeral that broke the mold — much like the legendary entertainer himself. There was a red guitar inside the casket, his protégé performed the duck walk, and other big names in music sent flowers and paid tribute. The Rolling Stones sent flowers in the shape of a guitar. President Bill Clinton sent a letter that was read by U.S. Rep Lacy Clay, D-St. Louis. Paul McCartney sent condolences and praise. Ultimately, people eulogized Berry for breaking racial barriers and creating a new musical genre. 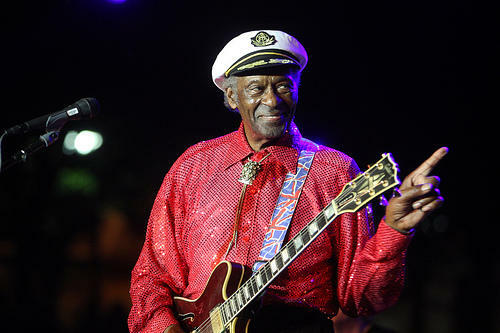 Chuck Berry’s son, Charles “Butch” Berry Jr. said they were right to call his father a civil rights icon. Charles Berry Jr. speaks to guests at a memorial for his father, Chuck Berry. Kiss front man Gene Simmons got choked up, saying he couldn’t let the day go by without coming to St. Louis and honoring Chuck Berry. Simmons said Berry’s songs spoke to him as a young boy who moved to the United States from Israel in 1958. “He changed more little white boys' and white girls’ lives than all the politicians with their big talk and stuff, just by grabbing hold of them and making them move like this,” Simmons said, dancing on stage. Congressman Clay said Berry did more than create hit records. “He combined his artistic genius with his enormous personal courage to help bring down the barriers of race, intolerance and bigotry in this country through his music,” Clay said. “For decades, he faced down hatred and discrimination in clubs, in concerts, in movies and in the criminal justice system and even in his personal life. 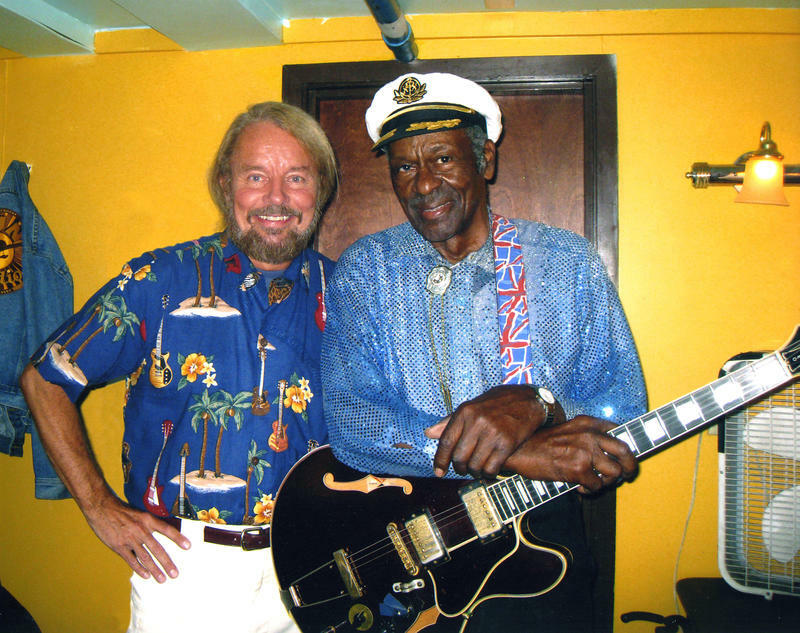 Marshall Chess of Chess Records shared his memories of Chuck Berry signing with his dad’s label in 1955 when Chess was 13. The music-rich memorial service featured a mix of genres fitting for Berry’s eclectic tastes. In addition to his own hit, "Johnny B. Goode," artists sang an operatic “Ave Maria” and a boogie-style version of the gospel hymn “Just a Closer Walk with Thee.” Johnny Rivers performed "Blue Suede Blues." Two of his grandchildren performed “Summertime” from the musical "Porgy and Bess." 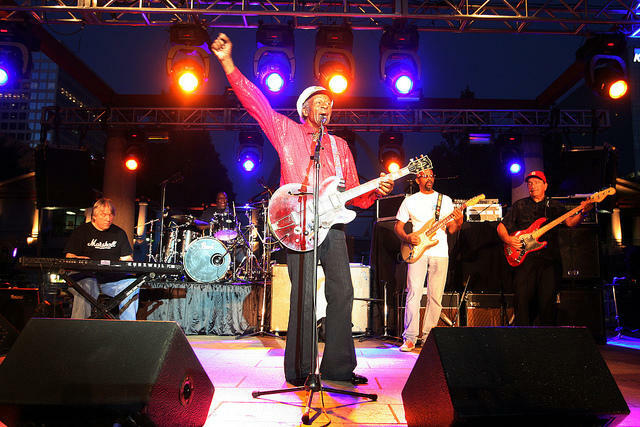 Chuck Berry was laid to rest in Bellerive Gardens on April 9. He died on March 18. He was 90 years old. 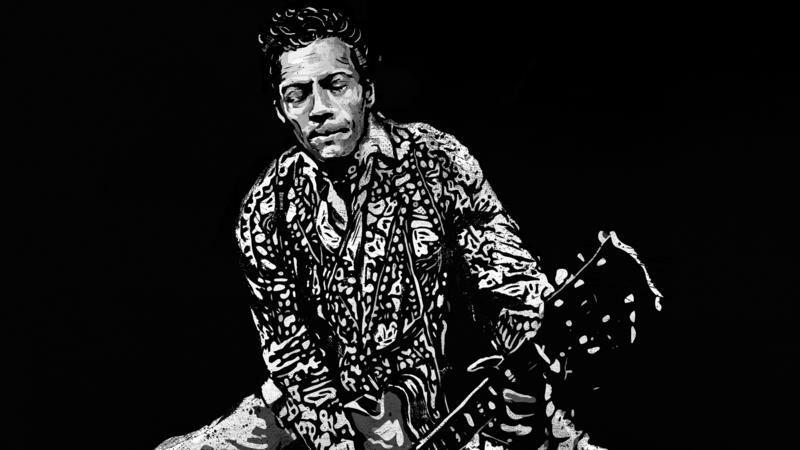 Less than a week after Chuck Berry's death at the age of 90, his family announced details Wednesday about the rock and roll pioneer's first album in 38 years — and gave us a taste of what it will sound like. 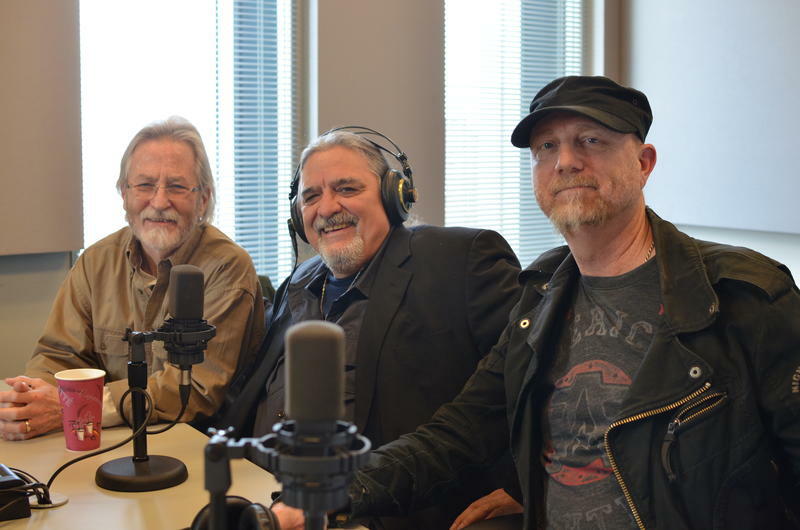 This article first appeared in the St. Louis Beacon: There was a time, more than two centuries ago, when the term “British invasion” would have instilled fear or outrage rather than hope. You know the story. Fifty years ago, however, that term was more welcoming to American ears -- younger ears, anyway. It signaled the coming of a fresh song, its lyrics upbeat and memorable, by a rock group called the Beatles. They would set a new solid-gold standard for popular music, beginning with the release of their first studio album, "Please Please Me” in 1963. On Wednesday’s “St. Louis on the Air,” several local musicians joined host Don Marsh to discuss a new recording of the famed Chuck Berry tune “Johnny B. Goode.” The recording will raise money to fund the completion of KSDK anchor Art Holliday’s documentary about Berry’s long-time pianist Johnnie Johnson, who many say the song is named in tribute of. The piano on the track was actually recorded by Johnson himself, before his death in 2005.